The Lenovo ThinkSystem NE0152T RackSwitch is part of the Lenovo Top of Rack (ToR) ThinkSystem CNOS RackSwitch family, tested and validated with Lenovo reference architectures to provide the best integration and support possible for Lenovo servers, storage, and networking in the data center. RackSwitch ToR switches interoperate seamlessly with other vendors' hardware and management and work with Lenovo XClarity Administrator for single-pane-of-glass server, storage, and network management. The NE0152T is optimized for enterprise data center out-of-band management. Implementing an out-of-band management network creates a separate path for critical server and switch management communications. Reliability is increased by providing a simple Layer 2 pathway that is not affected by the day-to-day provisioning on data switches. Having this dedicated network access to CLI ports reduces local human intervention which can delay issue resolution. A consistent user experience with other CNOS data-level switches to simplify operations and support. VMware vRealize Log Insight collects logs and events to determine root cause and produce reports across multiple devices and vendors with the included CNOS plugin. Open architecture, which is important to support flexible automation and control while integrating with industry standard applications and APIs. An ONIE version for Cumulus is also available (expected in first quarter 2019). Support for Ansible, Puppet, and Chef for easy incorporation into existing automation and devops. The purchase price includes all software features, management plugins, and Lenovo XClarity Administrator. Switches come with a 3-year warranty and include unrestricted software updates. 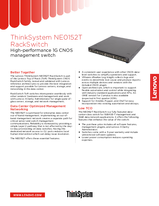 To learn more about the ThinkSystem NE0152T RackSwitch, contact your Lenovo representative or Business Partner, or visit lenovo.com/networking. For detailed specifications, read the NE0152T RackSwitch product guide. * Available soon. Check product documentation for the latest updates. Trademarks: Lenovo, the Lenovo logo, Lenovo XClarity, RackSwitch, ThinkAgile, and ThinkSystem are trademarks or registered trademarks of Lenovo. Other company, product, or service names may be trademarks or service marks of others. Document number DS0071, published November 27, 2018. For the latest version, go to lenovopress.com/ds0071.